Suicide Squad 45 is the beginning of a crossover with Aquaman, following on the recent events in that book, and in Mera’s miniseries. Those ended with Mera about to be crowned Queen of Atlantis, as the city rose above the waves, and unintentional consequence of their victory. 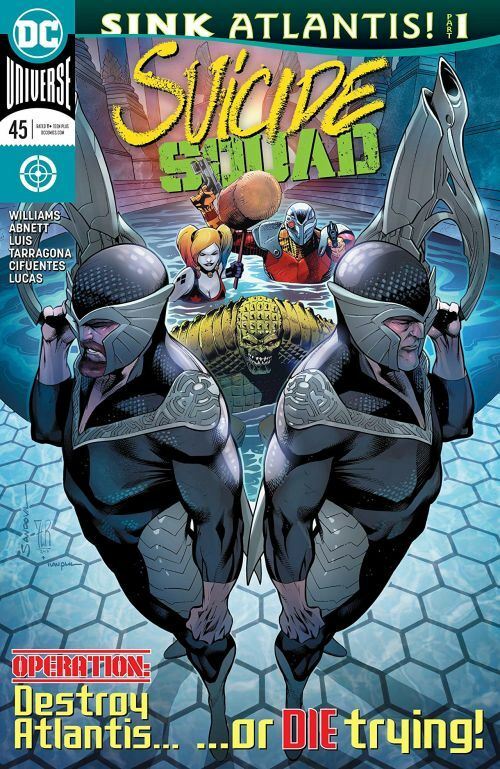 Williams is joined by Dan Abnett on this issue, and they do a commendable job of filling in new readers on both the Atlantean situation, as well as the way the Suicide Squad operates. The exposition is well handled, so it doesn’t slow things down or read too blatantly at what it is. The issue is also a must-buy for Aquaman fans, as the actual coronation of Mera takes place in this book. I found that a bit curious, to be honest. But most of the focus is on the Suicide Squad, dispatched by Amanda Waller on a mission whose true nature is kept from the team. Yup, that’s Waller for you. Love how untrustworthy she is. Two new members are added to the team in this issue, though neither gets much of a chance to shine yet. Lord Satanus, a long time, but rarely used, Superman villain takes the Enchantress’ place as the magician for the team, and another occasional Superman foe, the Master Jailer, is also recruited. Satanus is used mostly for comedic effect here, but is a power player when handled well. I am even more intrigued at the possible uses for the Master Jailer, who seems about the worst person to place into Waller’s hands. I would suspect this does not bode well for the inmates of Belle Reve. The issue leads directly into the next issue of Aquaman, where the action really gets going. But it’s a fun start with a good twist at the end.